As one of the most popular types of tents nowadays, dome tents are easy to spot due to their unmistakable dome-like shape. Most dome tents have a square or rectangular base with two or more flexible poles positioned in half-circles and crossing overhead to create their characteristic dome structure. Because of the slope of the dome, these tents generally have a lot more room – especially compared to basic ridge tents. Assuming the dome is tall enough you should be able to stand in it comfortably, which is great if you intend to spend time in your tent. Generally dome tents are designed to be free-standing – meaning they aren’t staked down to the ground and can be moved around easily even once pitched. That being said most dome tents are staked down eventually, so that they are better able to deal with inclement weather. Some dome tents may include other embellishments, such as a porch-like section at the entrance can be used for shade or to store equipment. That section may also be used to join several dome tents together to create a larger structure for groups. First pick a location (preferably one that is clear of debris) and lay out the tent. If the dome tent comes with a tarp you will want to lay that out first, and then spread out the tent on top of it while making sure the right side is facing up. 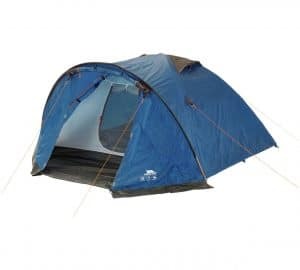 Most dome tents come with flexible poles that are folded when stored. These poles consist of small sections that are connected with an elastic bungee cord that runs inside them. All you need to do is attach the small sections together and the cord should ensure that they fasten into place. While there are different variants of dome tents, most will have flaps or tubes at the top of the tent where the poles can be inserted. Just run all the poles through the appropriate flaps so that they cross at the center. Raising a dome tent is easy, and you just need to take the each pole and fasten it to the eyelets at each corner. As you insert the opposite side of each pole you will have to bend them (which may require a bit of force) and the tent will start to rise and take shape. In many cases this step is optional as you may prefer your tent to remain free standing and may not need a rain fly. Normally staking a dome tent is easy as there are eyelets near the base that you can stake down, and attaching a rain fly involves draping it over the tent and staking it into place similarly. As you can see pitching a dome tent is pretty straightforward, which is part of why it is so popular when used for a camping holiday. The only step that may require some help is when you raise the tent and begin to bend the poles, but even that can be accomplished by a single person with a bit of experience.